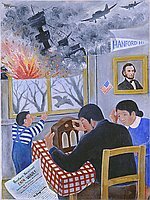 A Japanese family of three in Hanford, California listen to the radio about the bombing of Pearl Harbor by the Japanese. A bearded man sits with his back to the viewer at a checked cloth covered table, right hand tuning a radio. To the right, a woman in a white collared blue dress sits next to him, leaning against her right arm with a worried expression. Above her on the grey wall is a portrait of Abraham Lincoln with a small American flag sticking out of the yellow frame. A pennant, "Hanford HI" hangs above it. 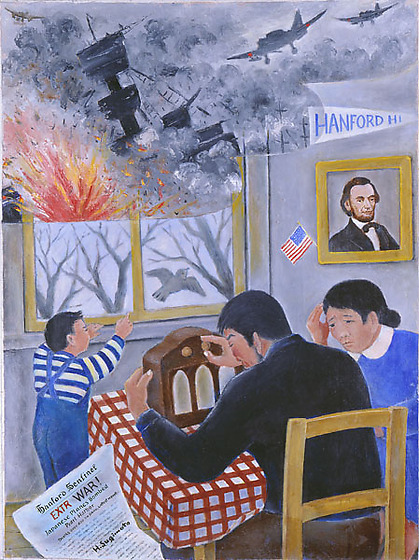 A little boy in a blue and white striped shirt and blue overalls stands in the left background, pointing out of the window at a bird flying away into a winter landscape. The upper half of the painting is dominated by a cloudlike scence, overlapping the domestic scene, of two fighter planes coming out of the upper right corner toward a sinking, smoking battleship, USS Arizona, exploding in red and yellow. A tiny plane is visible in the upper left corner.